Every day, all of us at Anchor Brewing are charged with an important responsibility. 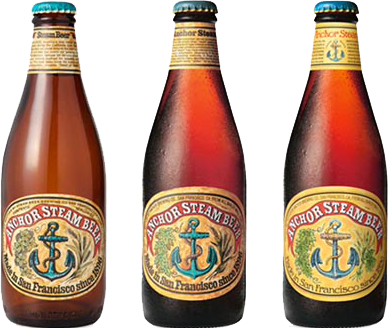 In addition to the daily duties involved with creating and maintaining our growing portfolio of handcrafted beers, we are tasked with the stewardship of a truly iconic brand: Anchor Steam® beer. The ever-evolving task is to usher Anchor Steam into the memories and palates of today’s craft beer enthusiasts. 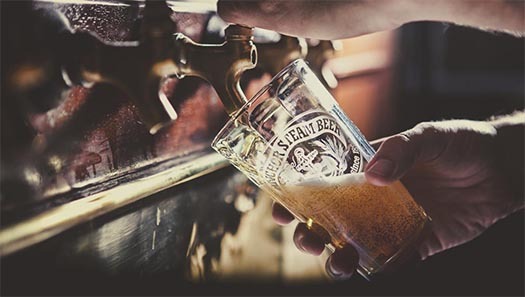 Ideally, the elements that support Anchor Steam – the heritage, the pioneer spirit, the unique brewing process, the distinctive flavor – come natural to those seeking more from the beers they drink. But some need more direct inspiration: an aromatic cue, a visual cue, a friend’s recommendation. With the right combination of these factors, the beer – and the brand – become something bigger; a lifestyle to ascribe to. 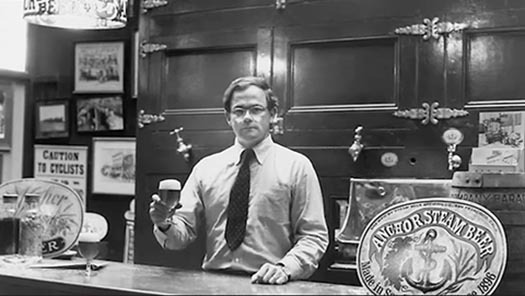 50 years ago this summer, Fritz Maytag acquired Anchor Brewing Company and went on to ignite a brewing revolution. To celebrate the 50th anniversary of the birth of American craft brewing, we thought the time was right for an update to the packaging for Anchor Steam. We’ve also created a series of events, videos, and a call to arms to loyal and new craft beer drinkers alike: Drink Steam. 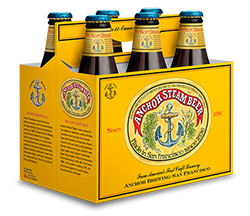 The concept: If you’re familiar with Anchor Steam’s label and six-pack carrier, you won’t miss a beat in recognizing it at your local store. For those unfamiliar with the brand, the new packaging will draw them in with its updated visual elements. And who could be more fitting for the task than artist Jim Stitt, who has designed virtually every other Anchor Brewing label by hand? The new packaging brings the first touch up since 1996, updating the visual elements with a brighter background yellow color. Jim has hand drawn the hops and barley that hug our anchor, and has updated the wooden cross piece. One of the most inspirational changes is the text on the bottom of the label. “Made in San Francisco since 1896” was completely hand drawn, not electronically designed or pulled from a database of typography. Another fun addition is new art for the crown. In addition to a fresh look for the top side, Anchor Steam drinkers will discover over 215 different pieces of trivia from 1820 to 2015 that will be printed under each and every crown. It’s conceivable to collect the entire history and trivia of Anchor Brewing with all of the different under-the-crown tidbits, which is a fun challenge for collectors of craft beer memorabilia. Everything is done with a purpose and a passion, and every element has a story behind it. As Fritz would often say, “What’s outside the bottle is a reflection of what’s inside,” part of a work ethic that is still present in every aspect of the brewery. From the constant cleaning and upkeep of the brewhouse to the enthusiasm of our brewery tour guides, great care goes into everything at Anchor. That culture has transcended years upon years, and today that same thought process weaves its way in and out of the brewery in every single job function here. Fritz Maytag in the Anchor taproom, circa mid-1970s. Just as the brewery has evolved over the years, we felt it was the right time for the packaging to follow suit. It’s interesting to think about the American brewing landscape back when Fritz took on the task of leading the charge, well before terms like “microbrewery” or “craft beer” were coined. Back then, Fritz and his team were creating beers that were radically different from what consumers knew or expected. The somewhat funky colors, wording, and the beer itself were all different by design. Fritz was serious about the beer he made and wanted that to come across in the packaging and presentation. Today, we may not need to shout out as emphatically as we once had to when it comes to Anchor Steam, but we wanted to bring the label forward to reflect not just where the brewery was 44 years ago when we started bottling, but where the brewery is today. A handmade beer deserves a handmade label. Whether you’re revisiting an old favorite or sampling America’s original craft beer for the first time, we invite you to Drink Steam! Use our Beer Finder to search for Anchor Steam near you. I began drinking Anchor Steam in college, around 1991. Haven’t stopped since. Back then, the name & label intrigued me. Now, I drink it because it is my favorite beer all these years later. I’ve tried quite a few microbrew & craft beer selections; none has ever measured up to Anchor. Keep making the best beer in America! 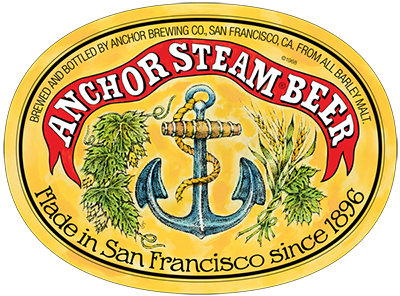 Congratulations to Anchor Brewing on it’s 50th anniv! I always try to buy your products, it’s Anchor that got me into brewing in the mid 1980s and still a favorite of mine. Also, you’ve had brilliant label and package design over the years, keep up the great work! I first had a Steam in ’84. It was a great primer for my Bavarian experience. It has made me what I am today.